Need Insurance for Forest Service Roads and the Trails? Get your Basic insurance and support BCORMA Trail Stewards. The BCORMA Bronze - Insured Trail Supporter provides the rider $500,000 of 3rd party liability insurance from Oasis Outdoor Adventure & Sport Insurance Solutions Ltd. for all two wheel off-road machine riders. Plus your purchase supports the trail stewardship work we perform all across the Province. The annual Bronze - Insured Trail Pass is valid for the calendar year, and includes a helmet sticker. The insurance provided is for the rider, so you can ride more than one machine and be covered in Canada and the continental United States. The price of the pass is pro-rated for the insurance portion according to the period you buy the pass The Bronze Trail Supporter & $500,000 Third Party Liability prices are: Oct 1st, 2018 – June 30th, 2019: $120; July 1 – December 31, 2019: $95; Optional Accident Benefits are available, see Oasis website. Current price charged by Oasis is already adjusted. Insurance coverage is to December 31, 2019 - giving up to 15 months of coverage. 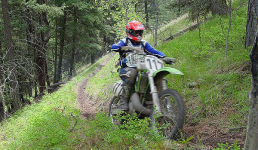 Continued trail stewardship of our off-road motorcycle trails in BC is vital for our and our children's future recreation. The funds go directly into trail stewardship projects at the riding area you specify and stay 100% in the summer motorized community. That includes: staging area developments, trail maintenance and rehabilitation to keep the trails sustainable & fun to ride, development of kids riding loops, signs & mapping so you know where you are, and camping area developments so your family can enjoy their stay. We use trail pass funding to match BC Provincial and Federal funding, getting a bigger bang for your trails contribution. 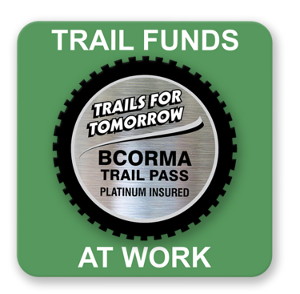 Thanks for supporting trails in BC with your purchase of a BCORMA Bronze - Insured Trail Supporter. Tell us where you want the trail funds used. When you get your pass in the mail, put it on your helmet, and carry your insurance certificate to show your friendly Compliance & Enforcement Officer. Thanks from all the volunteer trail stewards for supporting the trails.